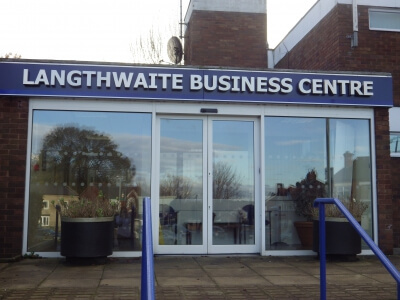 Following a complete modernisation Langthwaite Business Centre has developed into a tremendous resource for the community, hosting a wide range of services that you may wish to benefit from. 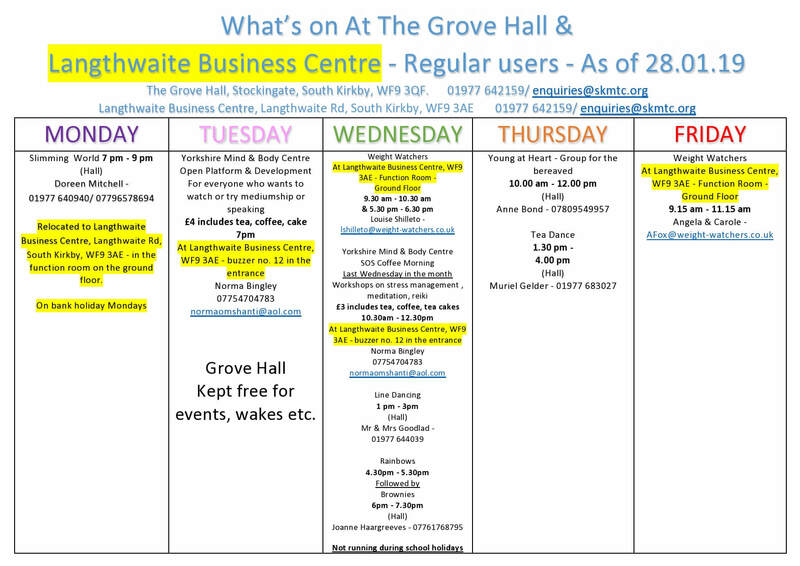 There are also weekly activities that take place at Langthwaite Business Centre as well via the image below. Appointments and training in holistic therapy are situated on the bottom floor text 07754704783 for further details or leave a message on The Yorkshire Mind & Body Centre Facebook page, link below. Massage is the manipulation of muscles, ligaments and tendons to help promote circulation and increase blood supply to the muscles so helping to alleviate pain and discomfort and promote the body’s ability to heal. Telephone 07816612424 for appointments. Langthwaite Business Centre can be hired for events, training and meetings 7 days a week. At The Grove Hall we have an on site caterer that may also be able to offer outside catering for your meetings at Langthwaite Business Centre upon request. Free Wi-Fi is available for use in Conference Room 1,2 and the Function Room. A room that holds up to 15 people that is ideal for small conferences/meetings and training events. Similar in design to Conference Room 1. A room that holds up to 15 people that is ideal for small conferences/meetings and training events. A well furnished modern room that holds 50 people approx. this room can be used for large conferences, training events or private functions. The first port-of-call to booking the Conference Room or Function Room is The Town Council’s office – The Grove on 01977 642159 or email enquiries@skmtc.org . If you also require refreshments and/or food for your booking please ring Craig Gallimore on 01977 326 362/ 07789 683374 after you have confirmed your booking with The Grove. At The Grove Hall we have an on site caterer that may also be able to offer outside catering for your meetings at Langthwaite Business Centre upon request. The caterer – Craig Gallimore is a Michelin star Chef that will offer you an affordable high quality service. The first port-of-call to booking the Conference Room or Function Room is The Town Council’s office – The Grove on 01977 642159 or email enquiries@skmtc.org.